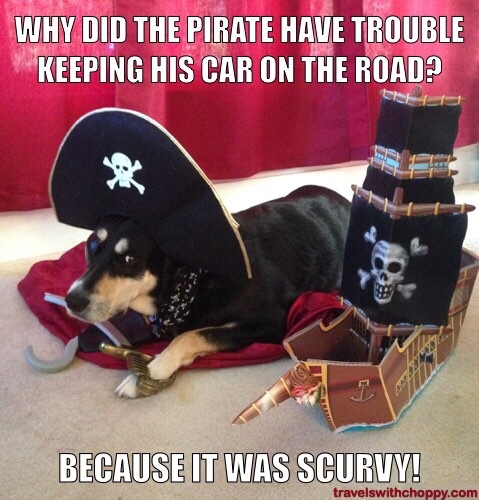 I hope you are all having a good start to the week – if not, here’s a bad pirate joke meme for you. Previous Previous post: Happy National Mustard Day! We try to keep things punny around here! Oh, there are more. I am thinking this should be a regular feature…and I can hear all the readers of this blog running for the door. Lol. Have a great week guys. Thank you! You do, too! Oh, there are more to come. They only get worse. i’m a day late reading this, but my laugh is real. Thanks. She is an inspiration (even if she had to dress as a pirate to be one! ).